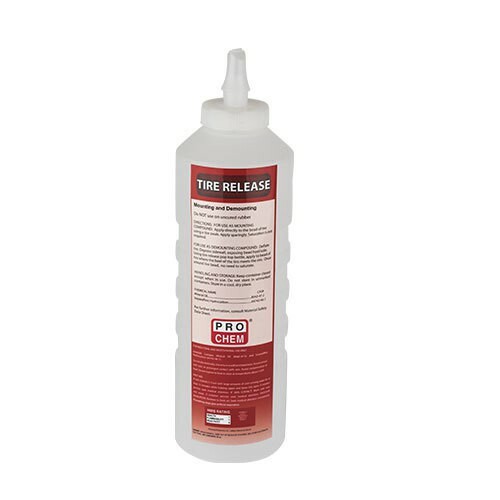 TIRE RELEASE | Pro Chem, Inc.
TIRE RELEASE is excellent for use on stubborn beads. It contains a penetrating catalyst that enters between the bead and the rim flange and lubricates for quick and easy demounting. It will not freeze. It is also an excellent mounting aid, which simplifies the number of materials used in tire mounting and demounting areas. FOR USE AS MOUNTING COMPOUND: Apply directly to the bead of tire using a tire swab. Apply sparingly. Saturation is not required. FOR USE AS DEMOUNTING COMPOUND: Deflate tire. Depress sidewall, exposing bead heel/sole. Using a trigger sprayer set on pin stream or larger capacity sprayer utilizing pin stream, apply to the bead where the heel of the tire meets the rim. A tire swab as also been proven to be effective with minimal waste. Use approved tools to separate tire bead from rim flange. Apply sparingly.